The ShurePlus®MOTIV Video recording app provides instant video recording with uncompressed audio for your mobile device. Customize the sound with digital signal processing (DSP) preset modes, adjustable gain, and stereo width control. When used with MOTIV microphones, there are preset modes available for a variety of recording situations. ① Menu Tap the menu to access general app settings or to open the about window for version information, help materials, and send feedback. 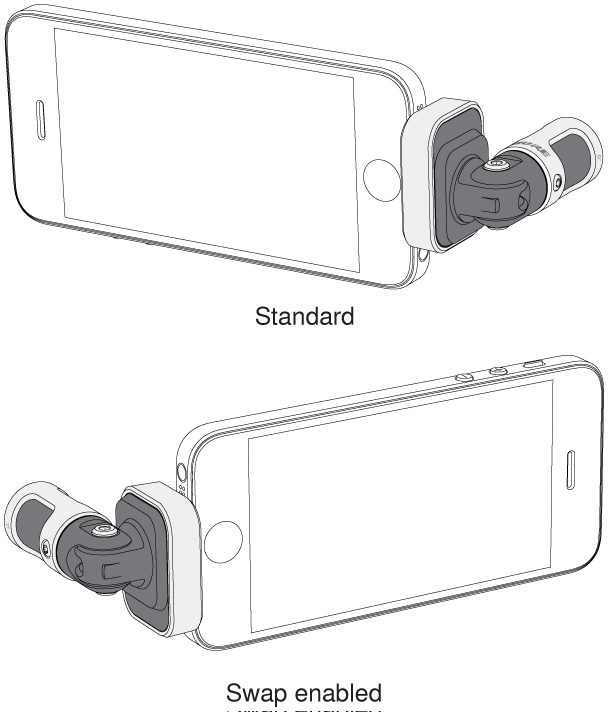 ② Connected Device Status/Recording Length/Focus Lock Status will display the model name of the connected MOTIV device. 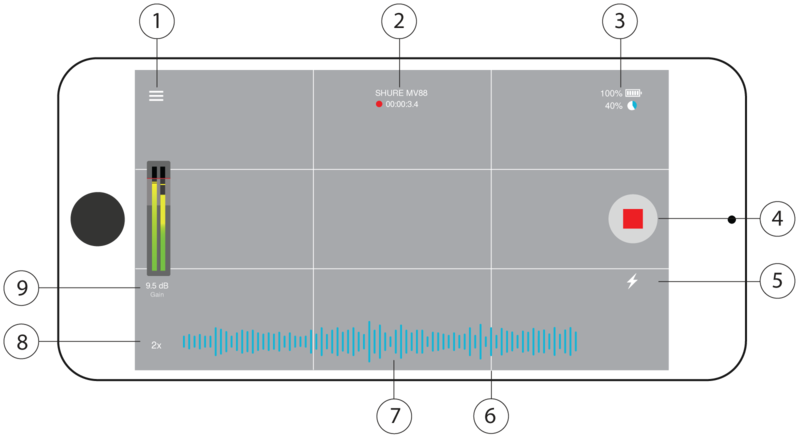 Recording length is displayed in hours, minutes, and seconds. See the Visual Settings topic for more information on focus and exposure. ③ Device Status Displays remaining battery life and available storage space for your recording device. ④ File Information Displays video format options. Audio file type: WAV, ALAC, AAC 96, AAC 128, AAC 256. Sample rate: 44.1 kHz, 48 kHz. Frame rate: 24 fps, 30 fps, 60 fps. 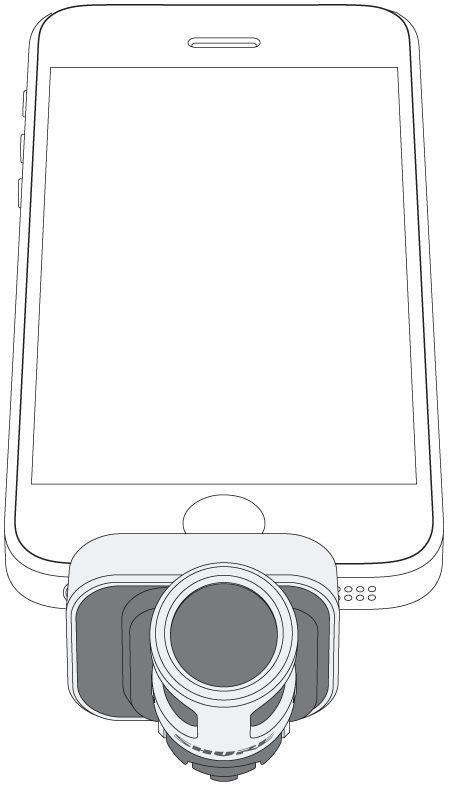 ⑤ Reverse Camera Use the front-facing camera to shoot selfie videos. ⑥ Mic Setup Access advanced microphone settings. See Mic Setup section for more information. ⑦ Record/Stop Button Start and stop video recording. ⑧ Flash Use the flash when recording in low light situations. ⑨ Grid/Level/Off Display Tap through to display grid lines or a level for easy image composition. Or turn this feature off if you prefer a clean display. ⑩ Microphone Gain/Audio Monitor Button Tap the input meter to bring up the mic gain window. Adjust to match the volume of the sound source. Make live adjustments to ensure levels are in the target range (indicated by the shaded region of the input meter). Tap the Audio Monitor (headphone button) to monitor your audio while you record. Or leave the monitor off and use the visual input meter. ⑪ Zoom Level Adjust your zoom level for a closer view of your subject. ⑫ Input Meter Displays the strength of the mono or stereo input signal. Tap to adjust microphone gain during recording. The loudest peaks should reach within the target range (indicated by the shaded region of the input meter). Note: Display will read AGC when using the app with the built-in microphone. Automatic Gain Control (AGC) adjusts levels to ensure consistent volume. Weaker signals are boosted and stronger signals are attenuated to control gain. The dynamic range is decreased but the result is a more even recording. Focus: The Focus icon automatically focuses on the center of the screen. Touch anywhere on the screen to manually select your focal area. Exposure: Touch anywhere on the screen and move finger up or down to manually adjust exposure level. ① Menu Select the menu to access general app settings and the About window for version information. ④ Record/Stop Button Start and stop video recording. ⑤ Flash Use the flash when recording in low light situations. ⑥ Photo Capture still photos during video recording. 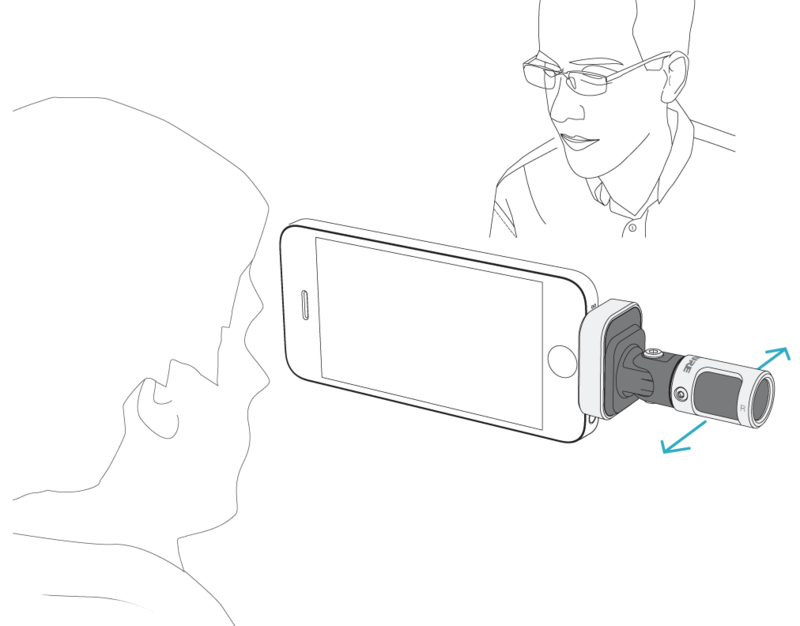 Photos get added to the recording device camera roll. ⑦ Grid Use the grid lines to assist in composing your image. 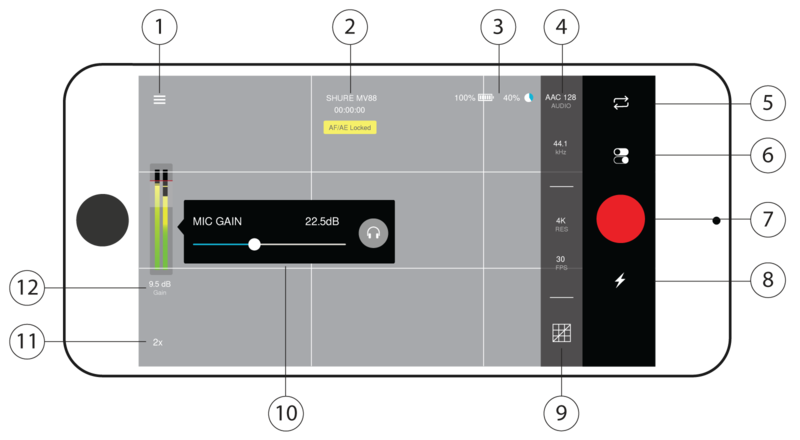 ⑧ Audio Recording The MOTIV Video App displays the waveform of the audio as it is recording. ⑨ Zoom Level Adjust your zoom level for a closer view of your subject. ⑩ Input Meter Displays the strength of the mono or stereo input signal. Tap to adjust microphone gain during recording. The loudest peaks should reach within the target range (indicated by the shaded region of the input meter). The MOTIV app controls microphone settings to optimize performance for specific uses. The MV88 stores the previously used settings for quick setup each time you record. This section suggests placement for typical use cases. Keep in mind that there are many effective ways to record a given source. Experiment with horizontal or landscape orientation, microphone placement and settings to find what works best. Tip: To ensure that left and right sides are facing the appropriate directions, check to see if the Shure name is clearly visible on the top of the microphone. If the name is not visible, turn the barrel 90°. ① Close Tap Close to return to the record window. ② Connected Device Status Status will display the model name of the connected MOTIV device. ③ Input Meter Displays the strength of the mono or stereo input signal. The loudest peaks should reach within the target range (indicated by the shaded region of the input meter). ④ Preset Modes Select a mode to set equalization and compression for specific applications. Refer to the "Preset Modes" topic for more details. ⑤ Microphone/Headphone Gain Adjust to match the volume of the sound source. Monitor the input meter when making adjustments to ensure levels are in the target range (indicated by the shaded region of the input meter). 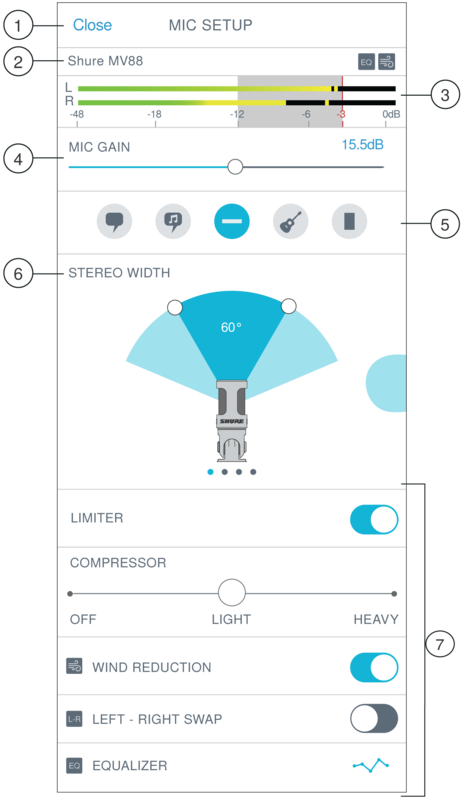 ⑥ Polar Pattern Selection Swipe to choose between Stereo, Mono Cardioid, Mono Bidirectional or Raw Mid-Side pick-up patterns. Then adjust the stereo width of the pickup area. ⑦ Advanced Features Select a preset mode, then fine tune your audio recording with advanced controls to dial in your sound. Your settings will be retained in the microphone. 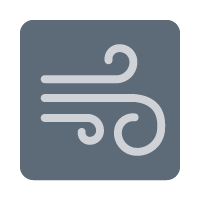 See "Wind Noise Reduction" and "Left-Right Channel Swap" for more details on these topics. 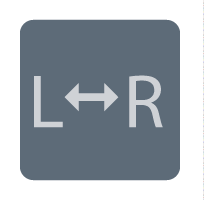 Limiter: Use the Limiter to control volume peaks by setting an input threshold. Compressor: Use the Compressor when your sound source is very dynamic. The compressor will narrow the dynamic range; quiet signals are boosted and loud signals are lowered. There are light and heavy compression options available. Equalizer: Use the Equalizer to boost or cut bands of frequencies to improve sound clarity. The EQ icon in the Mic Setup screen displays user-selected equalization. When you open the MOTIV app, a message prompts you to enable airplane mode and do not disturb mode. It's important to do this to avoid recording interference from phone calls, messages, and various notifications which can add static to your recordings. Note: Enable airplane mode and then turn Wi-Fi back on to add geolocation information to your audio file. Select a lower sample rate when it is useful to have a smaller file, for example, when recording speech or a podcast for download. Select a higher sample rate for music and dynamic recordings. 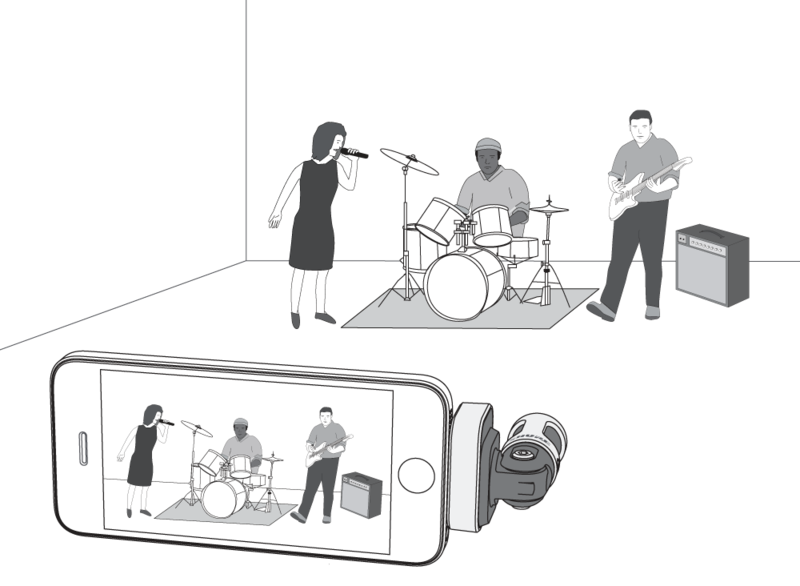 If your microphone accidentally becomes disconnected during recording, MOTIV will automatically stop the recording. The save file dialog will appear, prompting you to name and save your audio. Videos created by the MOTIV Video app can be shared from the MOTIV camera roll folder in your recording device. Mac® and Lightning® are registered trademarks of Apple Inc.